Congratulations on the birth of your baby! Becoming parents is one of life's greatest gifts, and I hope you will enjoy this incredible journey that you are about to go on! Being a parent myself, my phone got instantaneously filled up with pictures and videos of my newborn son, I'm sure you can totally relate, and I'm really excited you're considering booking a professional session because you will actually get to be IN the photos instead of just taking selfies! 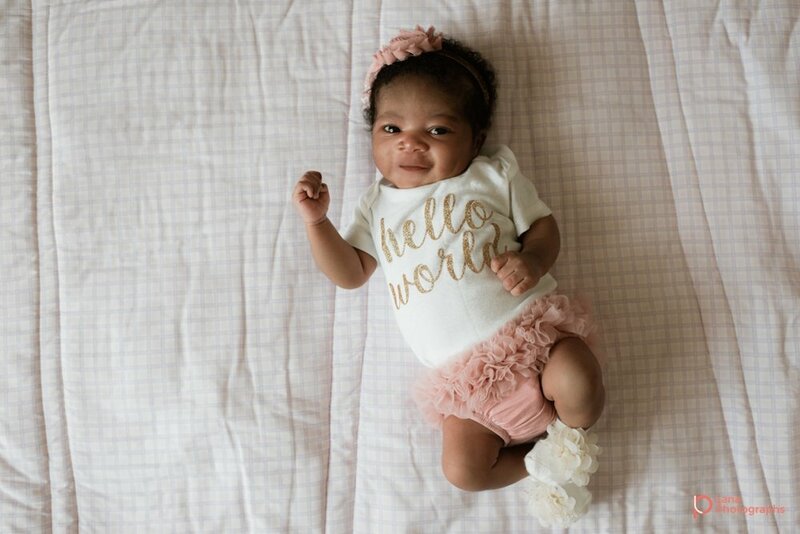 I know just how confusing it can be to prepare for a newborn photoshoot, and so I thought, I'll put together a little post that will answer any questions about how to best prepare for your upcoming shoot. This blog post will tackle several questions, for example, when is the best time to schedule a session, when is the best time to contact me as your photographer, the best places to have a session, should the baby be asleep or awake, and many more! To help, I've sectioned up this blog post to make it easy for you to refer to whichever section you think will serve you best. Enjoy! I recommend that you schedule a tentative date for your newborn session before baby arrives, that way you can make sure you've got a spot on my calendar. I cover several types of shoots starting from Fresh 48 sessions while you are still in hospital, so it is up to you when you would like the session to be. If you are booking a Fresh 48 session, I will jot down your due date on my calendar and we will be in touch as soon as baby arrives. If you would prefer to have a newborn session at home you have two options: 1. 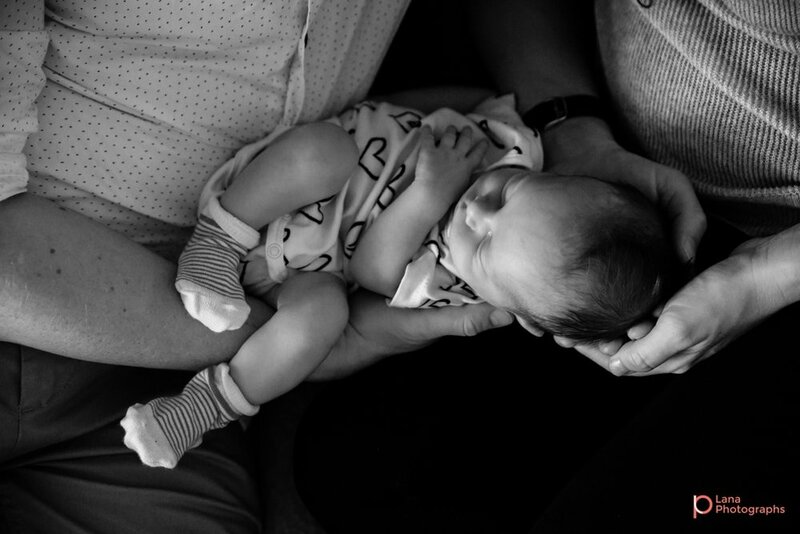 If you prefer capturing the very early days when baby settles down at home, then I recommend booking the session for when baby is about 7-10 days old. If you would prefer to wait until you are better accustomed to your new role as parents, then another fantastic time to shoot is around the 6-8 week mark. 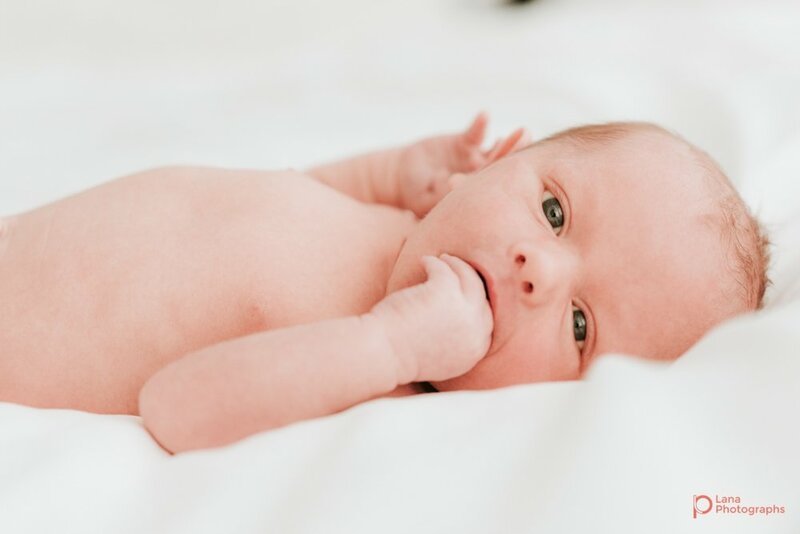 During that time, you can make sure baby is awake for some of the session and we can capture some incredibly adorable photos looking straight into baby's eyes. If you would like to book a Fresh 48 session, then I will come to your hospital room. 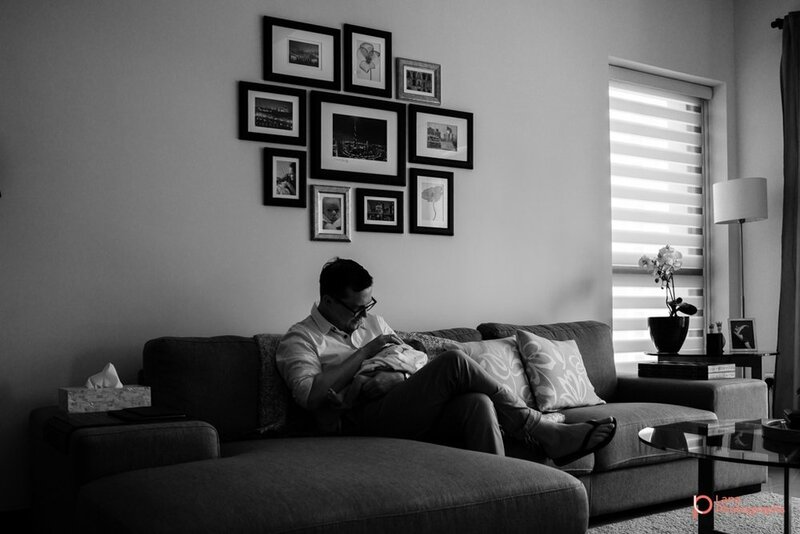 Otherwise, it is best to schedule newborn sessions inside (specially that it can get really hot here in the UAE, so it can get very uncomfortable for both you and the baby) Don’t worry about having to tidy up your home, you JUST had a baby! And trust me, I will not be judging you at ALL, because I've been there myself. Don't worry about clearing up clutter, I will work around whatever the situation is. I really like shooting in the nursery and also on mom and dad's bed, so if anything, all we will probably need to do is make the bed so it looks neat. It helps to think about where you would like to display your images. Do you want them safely guarded in an album that you can keep as a cherished family heirloom. Are they going to go up on the nursery walls? or perhaps in your living room? Let me know so I can take some shots specifically for your ideas. Wear whatever makes you comfortable! If you feel beautiful you will look and act beautiful so don't be shy to pamper yourself! Get your hair and makeup done if that helps you feel fresh! And wear colors that complement your skin tones. The simpler the clothing, the better. Try to stay away from large or loud prints and striped clothing as they do not photograph very well. A lot of the tips I shared in an earlier post on what to wear for a maternity session would also apply to a newborn session, so feel free to check it out be clicking here on this link. • Dad can wear solid shirt complimentary to mom's color. • Siblings should be in solid, neutral colors (cream, white, grey perhaps) to keep focus on the baby. 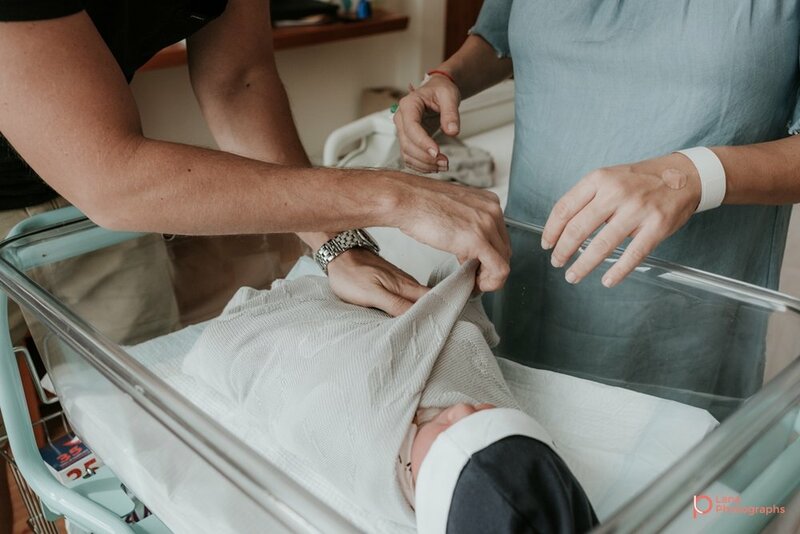 • Baby will be naked for some of the images, so it will help if everyone around baby is in neutral colors to keep focus on baby, specially if we will be using a colorful wrap (perhaps a gift from grandma? :) If you've got any special clothing you would like to photograph the baby in, keep it ready so we can take a few shots in them as well. Before I arrive, please have all your curtains open. Once I arrive we will do a quick walk through of your home looking for the best natural light for us. During the session, we will probably move and shoot in several rooms, so we can take best advantage of the beautiful light in your home. • Approximately 30 minutes before I arrive just make sure baby's diaper is loosened up. This helps to give the little imprints time to fade away. We will most likely start with the naked shots, so the less red marks on the baby's body the better. • Please feed and burp your baby right before the session, this will help keep baby calm and settled for when we are shooting on the bed in the beginning. There is a chance baby will get hungry and/or cranky so it is totally okay to take them for a quick feed and burp, and I will probably ask you if you would like me to shoot through these moments as well. • Have all the special clothing that you would like us to shoot in ready and at hand for when we will use it during the session. • Relax and have fun! Being a mom myself, I have plenty of experience with newborns, so you are in safe hands! I want you to enjoy your session to the max, so if you find baby is not "cooperating" please try not to stress, it is all part of the experience, and I promise you, your photos will still come out looking beautiful! Don't let this stress you out. 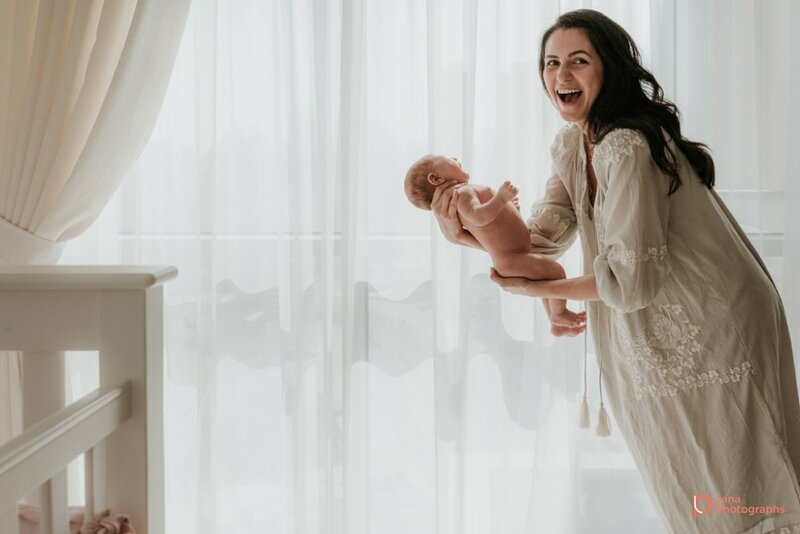 Every situation is an opportunity for a photograph, so if baby needs to eat or get a diaper change or just a quick cuddle, feel free to go ahead as you normally would! Babies know when their parents are stressed, so keeping the environment mellow and calm helps to keep the baby calm. • Ok, let's face it. Poop happens. It's normal, it's expected, and newborns do it A LOT! So don't be embarrassed if it happens. We simply clean up and move on. In fact, some of my best shots were right when baby decided to pee or poop on mom or dad, so if that happens to you, what a wonderful gift it will be! It will help to have extra blankets in case accidents happen, and wipes to clean up baby's bum. • Finally, rest assured that your baby is in safe hands. If there is ever a point in the session where you become uncomfortable, please just let me know. The baby’s safety comes first. I'm really looking forward to meeting you and your bundle of joy!